This is the second post in the challenge series of posts. One of my friends was struggling to get an affiliate application completed. So this is the task. You register yourself, you sign into the application and then you get a unique registration affiliate code. Using that code, whoever registers, will become your sub-affiliates. We are making the Username the primary key and also Email unique, so that people cannot register more than once. To keep things simple, I am going to use BootFlat Admin by Silverbux and crack on with the UI stuff. // Inserts the data into a table. // Executes the given SQL, else returns false. // Returns a result set of the SQL, else returns false. // Sanitises the user inputs to avoid MySQL Injection. // Returns the last inserted ID. Functions to help with Database Management. The next is a check inside the system.php, to make sure that the request is both POST request and it contains the action parameter as well. The simple switch statement does the job of checking the action and based on that, the data is inserted or the session is set up. Main thing it does is, setting $_SESSION variable and mysqli_query("INSERT ..."). Note: I am keeping this UI as minimal as possible and not using any custom CSS for this. For more information, please refer to Bootstrap Documentation. And then once you sign up and sign in to the application, you will see the following screen. This part detects if the server is running on HTTP or SSL. This gets the current domain name of the requested URL. This gets the requested path after the domain name. 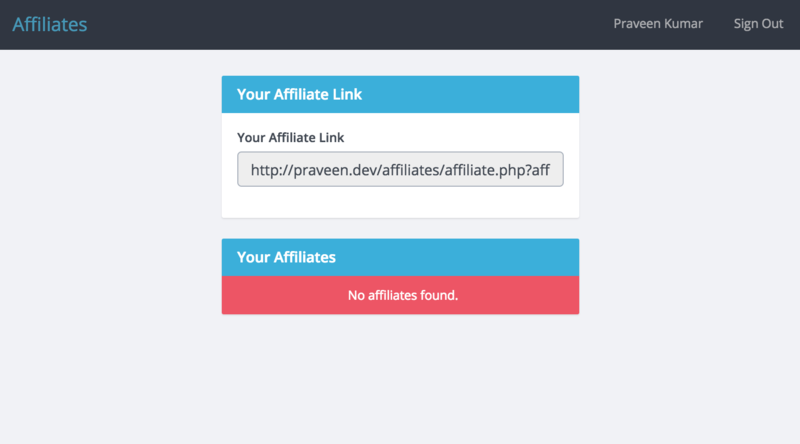 We need to pass the username to the affiliate.php file as a parameter affiliate. Gets the current username from the session. Include the database connection and start the session. Checks the sanitised input with the content of the database. This is a sanity check to make sure non-existent users are not added to the database. Session is set if the referred affiliate is found. Send the user back to the registration / login screen. Caveat: If the user signs in with an existing username and password, our current logic will remove the affiliate referral. This seems to be kind of okay, as we are targeting only the new users and not the existing ones. Along with the registration data, the Parent value will also be set and sent to the database. If this entry is not available in the session data, then NULL will be stored in the database. The record that doesn't have any parent will have its Parent field stored as NULL, while those that have their affiliates will have their usernames stored in the Parent column. To list out all the affiliates of a currently logged in user, we need to run a simple SELECT query with some extra WHERE parameters that help in getting those registered under the currently logged in user. The whole program has been completed without much styles, but having a great look. 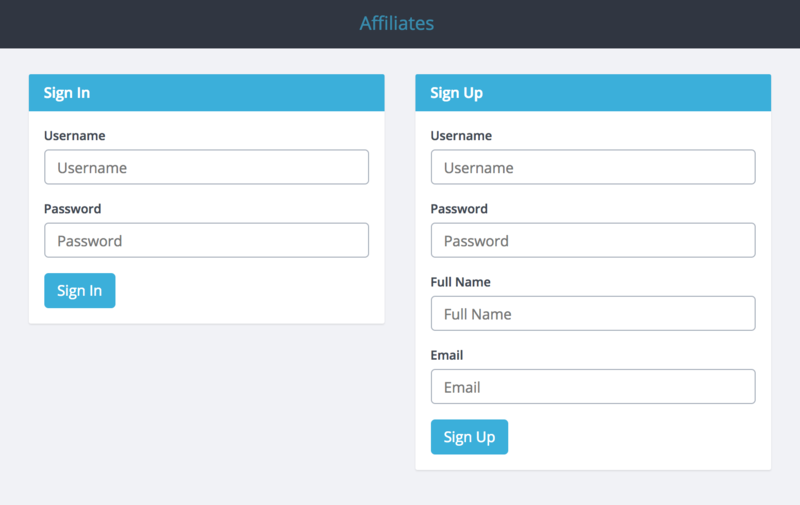 In the next challenge, we'll see how to show the hierarchy of your affiliates. As usual, if you have any comments, please do use the below form. If you have a better idea, please feel free to let me know. Do share it with your friends, colleagues and network. Until next time then.